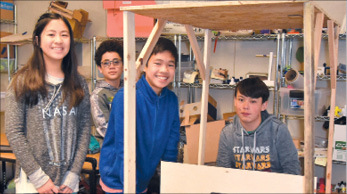 Bullis Charter School students Naomi Ichiriu, from left, Noah Kaufman, Caleb Chen and Andy Nilson collaboratively developed a hydroponics system under the guidance of teacher Mick Coleman to grow plants without soil. As seventh-graders at Bullis Charter School, we recently completed a three-week Engineering & Design Intersession (EDI) to solve real-world problems. Our group chose to solve a problem presented by Bullis Charter School MakerSpace teacher Mick Coleman, which was to develop a hydroponics system to grow plants in a space-efficient manner in his classroom. Our EDI group decided to design and physically construct a table that would grow plants without soil. The process was long and difficult, but our final product came out well and fit Mr. Coleman’s needs. Using the engineering design process, we first interviewed Mr. Coleman to gain his perspective and needs in order for our group to design a solution. Mr. Coleman wanted a vertical table that water could flow through, that he could hang lights on and one where he wouldn’t have to bend down to reach. We changed our design multiple times to fit Mr. Coleman’s requirements. This step in our EDI project made us more empathetic to Mr. Coleman’s wants in the hydroponics system. Our group created a prototype of a tall, vertical table with a frame and a top, so lights could hang from the wooden top by a clip. The prototyping process was very useful in getting our ideas out; however, we would have liked more time to make a more detailed rapid prototype. Because we were continually revising and changing our ideas, the prototype we made was nothing like our finished project. During the testing phase of the project, we tried out different ideas in the form of a physical model and also created 3-D models using the computer program SketchUp. We used these to troubleshoot and redesign, based on what we learned. In addition, we interviewed Mr. Coleman periodically to keep him updated on our progress and project in general. He gave us feedback, which we used to modify our project and ensure that our project suited his needs. One of the most valuable things we learned was the importance of ideating. Throughout the design process, we used ideating and iterating on our ideas to improve our design. We also used ideating to solve problems our group encountered. For example, when our project was too tall for the door, we took apart the frame and made it detachable, ultimately making it easier for our user as well. Another valuable thing we learned was how to cooperate. One of the many challenges our group had was learning how to work well together. We resolved this by figuring out our individual skills and created roles for everybody based on their strengths. Bullis Charter School’s HydroGrow team members Caleb Chen, Naomi Ichiriu, Noah Kaufman and Andy Nilson co-authored this column.